Day 2, time for the second car in the series: the AMC Rebel Machine. Yesterday, I looked at the Morris Mini. I made a mistake and didn’t flip it over to see if the body popped off the chassis, I promise I won’t make any mistakes with this Rebel review! A complete 180 from the Mini, the Rebel Machine represents brute strength, blunt force, and America in the series. Hot Wheels likes to bring out the Rebel Machine casting whenever a badass occasion arises. Previously, we’ve seen it before in a sweet lime green spectrafrost color for the Cool Classics series, and in its iconic patriotic getup in the Boulevard Series. For it’s third time around, they went straight up red and black, complete with white lettered Real-Riders. Combined with THAT RAKE!, the color scheme make the Forza graphics pop off the back quarter. 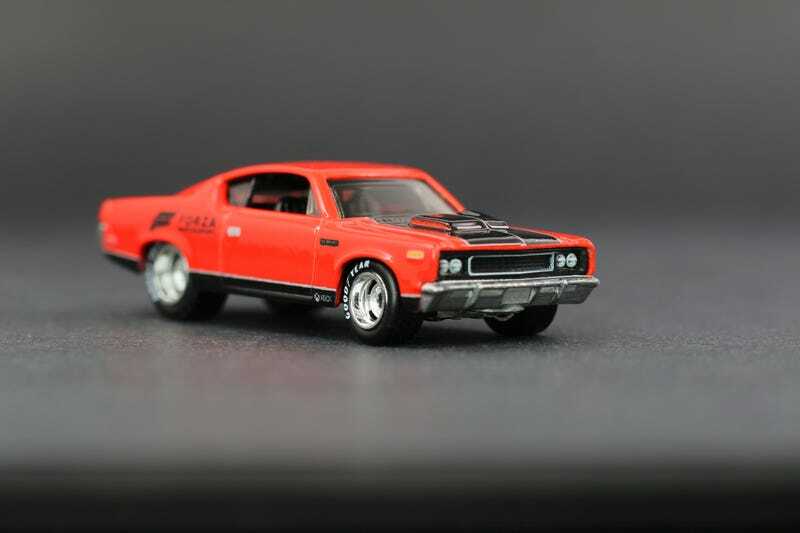 Not to mention, the AMC muscle cars are so offbeat and down right cool. Its so hard to rank this one my third favorite in the series, but you’ll have to wait out the rest of the week to see why!